Irene Kern Ray, 86, passed away at 10:32 am on April 2, 2019 at Good Samaritan Hospital. Irene was born on January 19, 1933 the daughter of Theodore George and Valia (Popovesky) Kern. Irene was a graduate of Vincennes Lincoln High School and went on to earn her associate degree from Lindenwood College in Saint Charles, MO. She worked for American National Bank as an Administrative Assistant for many years and later served as secretary for Back to Health for a number of years. 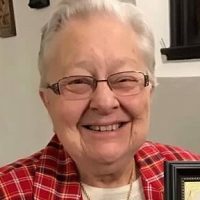 Irene was a member of St. James Episcopal Church where she served in numerous capacities, including, Secretary-Treasurer, Administrative Assistant, served in every capacity on the vestory, Altar Guild, ran the food pantry, sang in the choir. She was selected in 2016 by the Episcopal Diocese of Indianapolis as an Honored Woman of the Church. Irene was also instrumental in organizing the annual Halloween Safe Stop, was a past member of Psi Iota Xi, was past chairman of Psi Ote Follies and had been a Red Cross Volunteer. She also was an avid cat lover, and enjoyed feeding birds and gardening at her home as well as the church. Irene also enjoyed watching sports, was a huge Colts and Notre Dame fan and enjoyed her granddaughters and great grandchildren. Survivors include her daughter, Barbara Fabyan and her husband Joe of Leesburg, IN; grandchildren, Janelle Michel and her husband Rob, Katelyn Wilson and her husband Jarrod; great grandchildren, Hailie and Levi Michel, Sadie Wilson; nephew, Ted Kern; niece, Ann Kern and several great nieces and nephews. Irene was preceded in death by her parents, her brother, George Kern and a sister, Nina Kern. Friends may visit with Irene’s family on Saturday, April 6, 2019 at St. James Episcopal Church, 610 Perry St. Vincennes, IN from 9-11 am with a funeral service to start at the conclusion at 11:00 am with Rev. Dennis Latta officiating. Irene will be laid to rest in the church garden. In lieu of flowers contributions may be made to St. James Episcopal Church. On line memories may be shared with Irene’s family and friends at www.goodwinfamilyfh.com. Goodwin Funeral Home is honored to assist Irene’s family with arrangements.